© 2002, © 2018 by Paul Freeman. Revised 10/27/18. Maker Field, as depicted on the February 1950 Dallas Sectional Chart. Maker Field was established after WW2 by former military flight instructors Red Maker & his brother-in-law Lester. They came to Abilene in 1945, and lived at the airport for a year or so. Maker Field was not yet depicted on the March 1946 Dallas Sectional Chart. The earliest depiction which has been located of Maker Field was on the February 1950 Dallas Sectional Chart. It depicted Maker Field as having a 3,000' unpaved runway. In 1950 or 1951, local businessman Jack Hughes wanted to buy the property to put up a shopping center. He ran the airport for a short period of time, renaming it Hughes Airport. 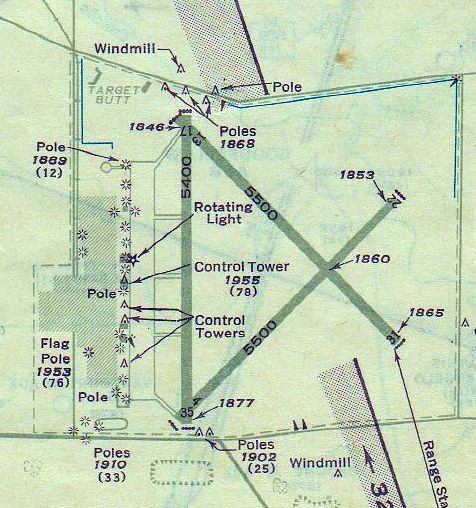 Hughes Airport, as depicted on the 1954 USGS topo map. 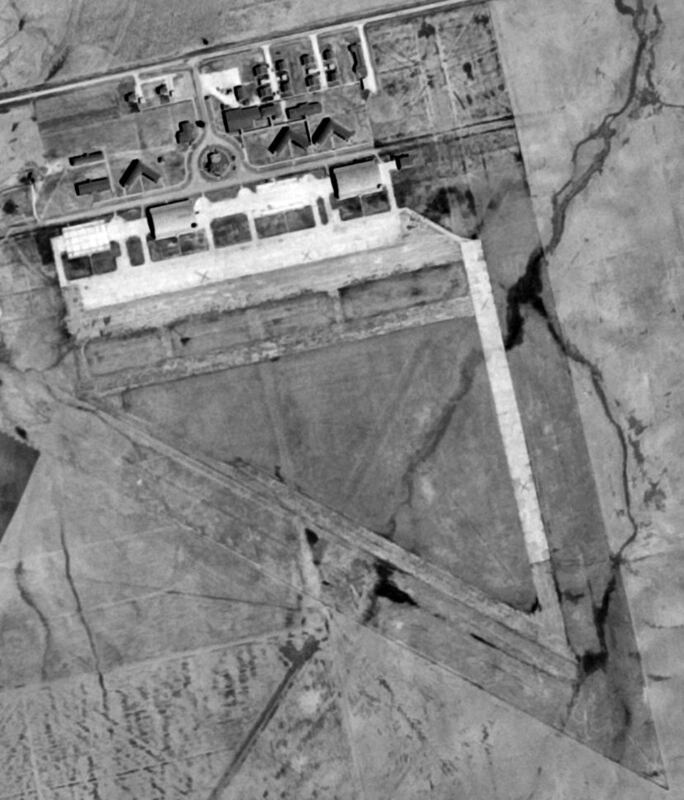 The earliest photo which has been located of Hughes Airport was an 11/19/54 USGS aerial view. 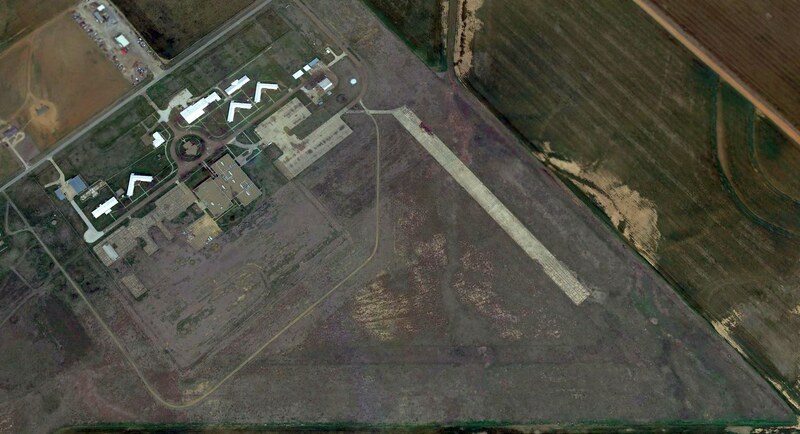 It depicted Hughes as having 3 unpaved runways, with a few small hangars on the northeast side. According to the 5/25/10 Clack Middle School Chronicle (courtesy of Mark Williams), Earl Outland ran the Hughes Airport. Don Bledsoe learned to fly at Hughes, and became a lineman at the airport. The field had a main hangar, sales office, T-hangars, and over 100 planes. The field featured fly-outs, hangar parties, and flying shopping excursions. Jack North remembered flying out of Hughes Airport several times. 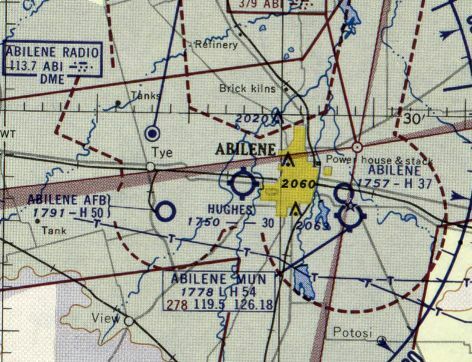 The last aeronautical chart depiction which has been located of Hughes Field was on the February 1955 Dallas Sectional Chart. It depicted Hughes Field as having a 3,000' unpaved runway. 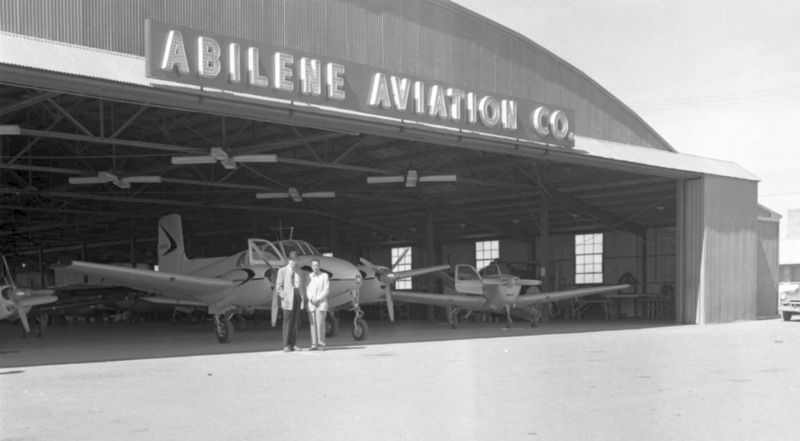 A 1956 photo depicted a Beech Twin Bonanza & another Bonanza inside the Abilene Aviation Company hangar at Hughes Airport (courtesy of Mark Williams). 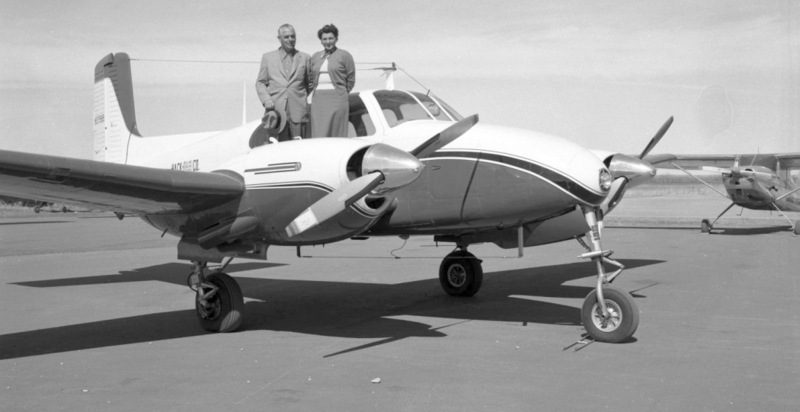 A 1956 photo of an unidentified couple on a Beech Twin Bonanza at Hughes Airport (courtesy of Mark Williams). A 1956 photo of a Stinson 108-1 in front of the Hughes Airport T-hangars (courtesy of Mark Williams). 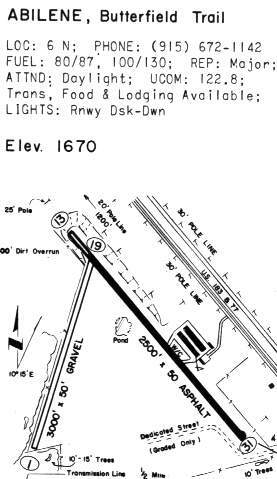 The 1957 USGS topo map (courtesy of Mark Williams) depicted Hughes Airport as having a north/south paved runway with a taxiway leading to 2 buildings on the northeast side. The 2 other runways depicted in 1954 had been lost, as the airport property had been reduced by the construction of Route 83 along the west side. The construction of the bypass at Loop 322 & South 1st was a factor against the longevity of Hughes Airport. as it was no longer depicted on the August 1960 Dallas Sectional Chart. Jack Hughes opened the Westgate Shopping Capital on the Hughes Airport property in 1962. 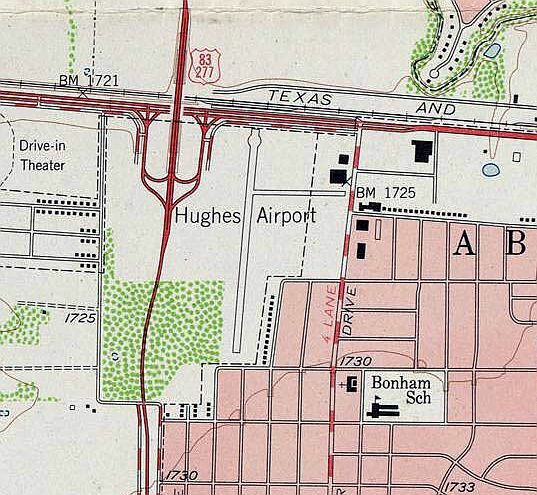 The 1968 USGS topo map depicted the shopping center covering the Hughes Airport property. 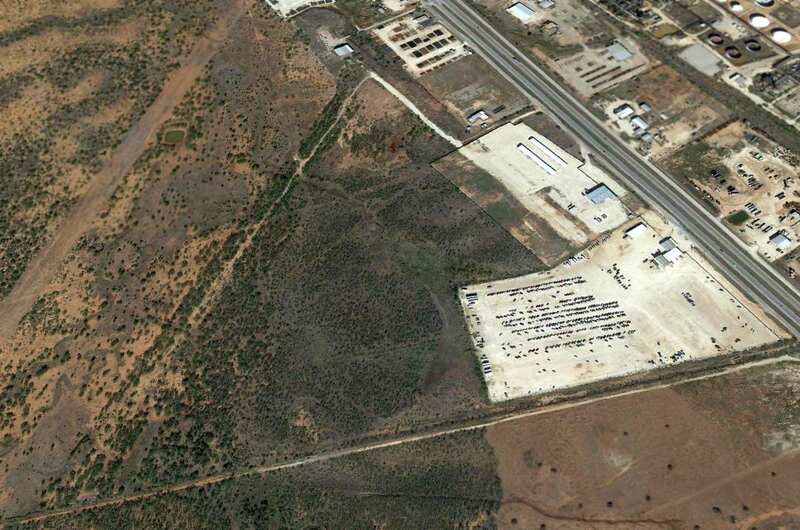 A 12/9/12 aerial view showed no trace remaining of Hughes Airport. The site of Hughes Airport is located southeast of the intersection of South 1st Street & Route 277. Thanks to Mark Williams for pointing out this airfield. on the 1941 Austin Sectional Chart (courtesy of Chris Kennedy). as it was not yet depicted on the August 1940 Austin Sectional Chart. The earliest depiction which has been located of Goodfellow Field was on the 1941 Austin Sectional Chart (courtesy of Chris Kennedy). 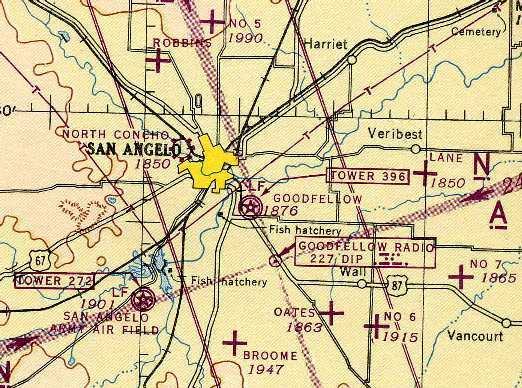 It depicted Goodfellow Field (as an unlabeled military airfield) just northwest of the predecessor "San Angelo" civilian airport. when the first class of Army Air Corps students arrived to take basic flying training. Primary & basic flight training was provided at Goodfellow for American & foreign cadets. The North American BT-9/14 Yale & Vultee BT-15 Valiant were used at Goodfellow in 1941. Goodfellow AAF consisted of a total of 1,137 acres. A rare color photograph of a Vultee BT-13 Valiant at Goodfellow Field in 1941. The BT-13 Valiant was used at Goodfellow from 1941-45. A 1942 photo of a huge number of BT-13 Valiants on the flight line at Goodfellow Field. 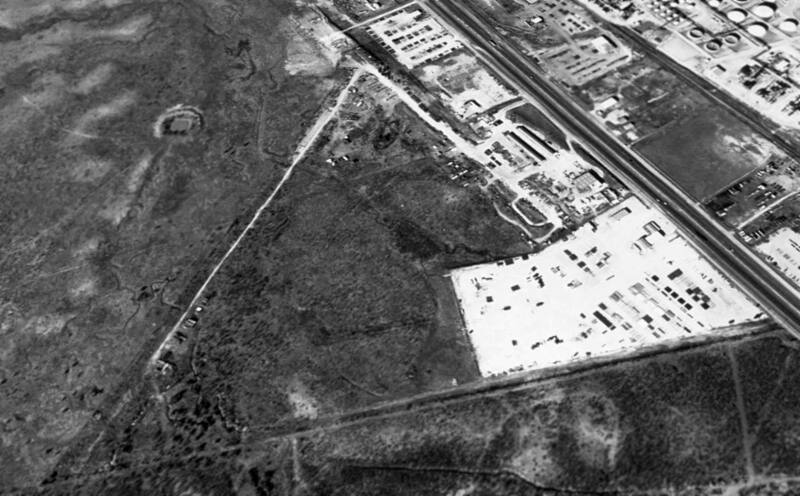 A 1943 aerial view looking east at Goodfellow Field. described Goodfellow Field as having 3 asphalt runways, with the longest being the 5,500' northeast/southwest & northwest/southeast strips. and Wall Aux #7 (3 miles ESE of Wall). while the Stearman-Boeing PT-13/17 Kaydet primary trainer biplane was used from 1944-46. The North American AT-6/T-6 Texan Basic/Primary Trainer was used at Goodfellow from 1944-54. 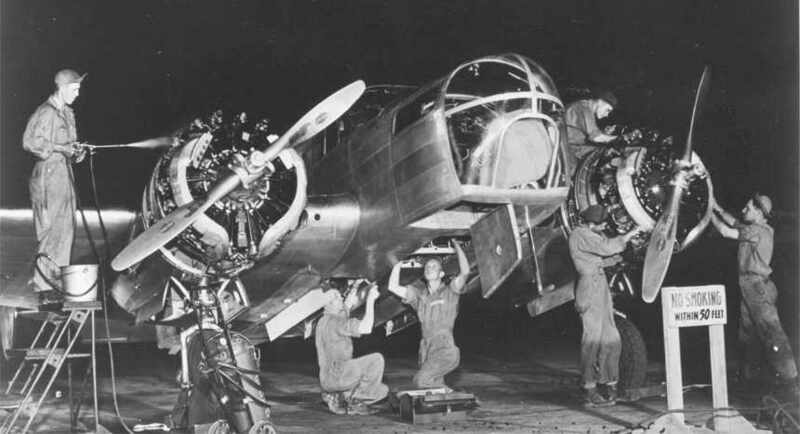 A WW2-era photo of an AT-11 undergoing a nighttime inspection at Goodfellow AAF (courtesy of Cole Perkins). The satellite fields surrounding Goodfellow AAF. 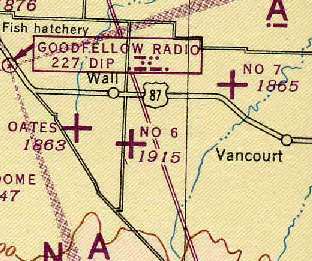 Goodfellow AAF & its satellite fields, as depicted on the 1945 Austin Sectional Chart (courtesy of Chris Kennedy). and North American B-25 Mitchell all served at Goodfellow from 1945-46. Goodfellow trained a total of 10,000 airmen during the Second World War. Goodfellow AAF was retained after WW2. The Douglas C-47 Skytrain was used at Goodfellow from 1946-71.
an installation of the Air Training Command. as having a 5,500' hard-surface runway. 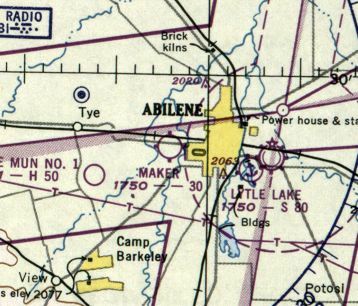 A 1951 approach plate (courtesy of John Price) depicted Goodfellow AAF as having 3 paved runways, with the longest being 5,500'. A ramp, hangars, and control tower were depicted on the west side of the airfield. The Beechcraft C-45 Expediter was used at Goodfellow from 1951-54.
using the Beechcraft YT-34 Mentor & the TEMCO YT-35 Buckaroo. The Beechcraft AT-7/T7BH Navigator Basic Trainer was used at Goodfellow in 1952.
while the Piper L-21 Super Cub was used from 1952-54. The North American T-28 Trojan Basic Trainer was used at Goodfellow from 1953-55. The North American B-25 Mitchell returned to service at Goodfellow from 1954-58.
as depicted on the 1954 Edward's Plateau World Aeronautical Chart (courtesy of Chris Kennedy). 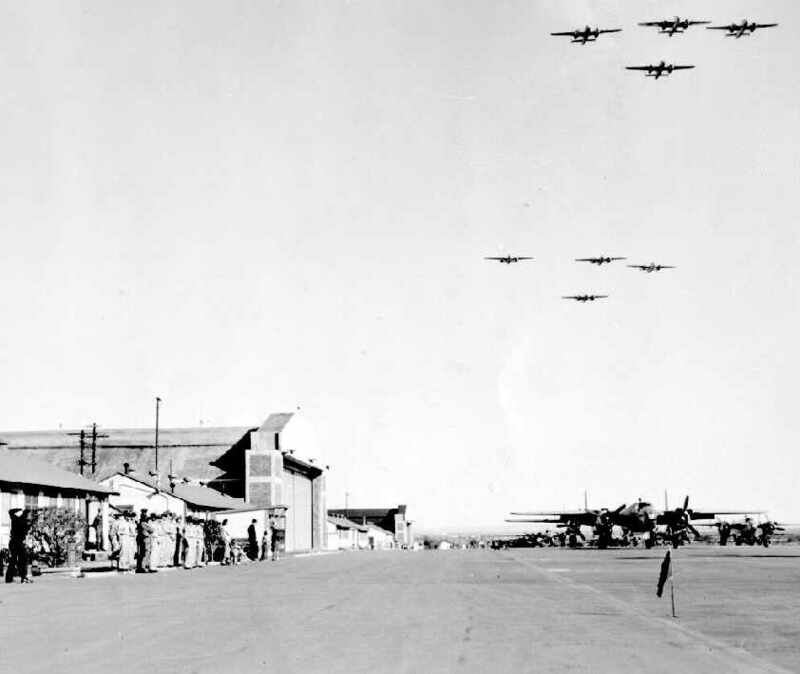 A 1956 photo of a formation of North American TB-25 Mitchells passing in review over the Goodfellow AFB flightline. which was used in a test program from 1956-57.
while the Piasecki H-2 Workhorse helicopter was used for weather missions from 1958-66.
at which point it had trained a total of 20,000 aviators. and its new mission became the training of Air Force personnel in advanced cryptologic skills. for Army, Navy, and Marine Corps personnel. The DeHavilland U-6 Beaver was used for weather missions at Goodfellow from 1960-66. A 1966 aerial view looking south showed cars along along Goodfellow's ramp but no planes. at which point the last 2 examples were transferred. 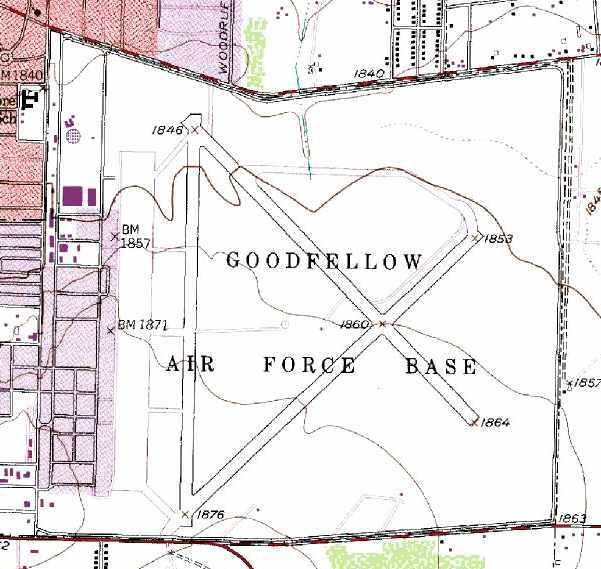 Goodfellow's runways were permanently closed in March 1975. 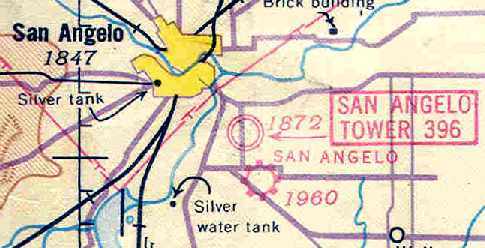 The 1978 USGS topo map still depicted Goodfellow AFB's 3 paved runways, ramp, and hangars. by C-130s participating in Readiness Loading Program activities. 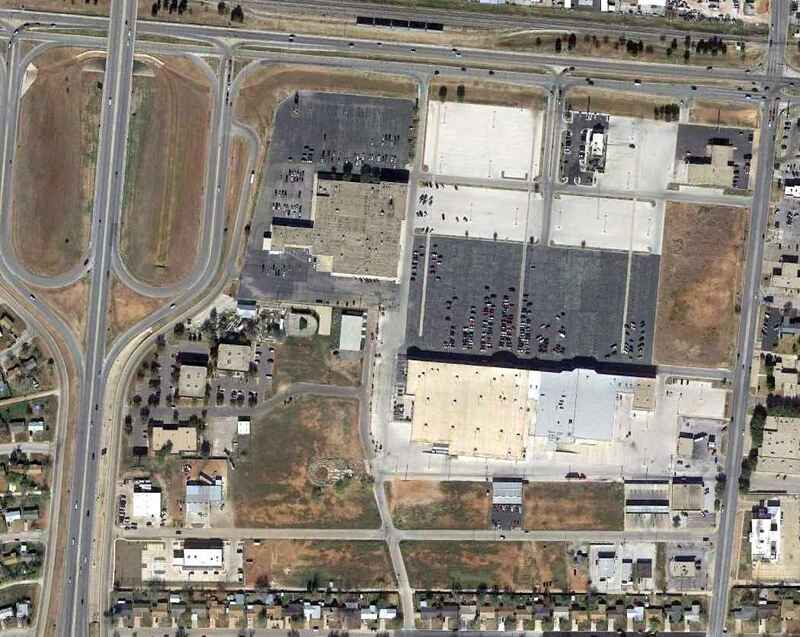 Mark Williams recalled, “Goodfellow AFB... I was stationed there from April-August 1983. While there I started taking my private pilot's course with the base flying club, and flew from the then-closed runways enough to get just over 20 hours. My instructor was an active duty, USAF Lt. Col., and the base chaplain! God may not have been my co-pilot, but I had the next best thing! My last flight there was rather eventful, or I should say the landing was. At the time they were just beginning the construction which resulted in what we see at Goodfellow today. but generally they were done for the day when started our flying in the early, West Texas summer evenings. 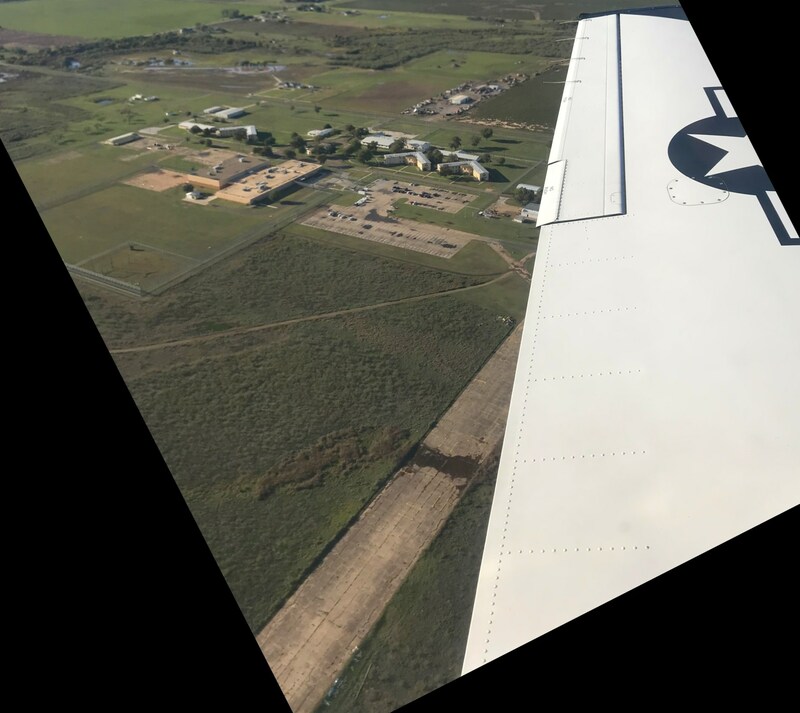 This particular flight was spent shooting approaches at San Angelo's Mathis Field, and when we finished flew back to Goodfellow. It was going to be 'my' landing, but on very short final a road grater drove onto the runway. My instructor first told me to go around, then stated he had the aircraft. I gave the controls to him, and acknowledged that it was 'his' aircraft. He extended the final flying over the grater, then landed ('Geez, Chaplain!'). No sir, I said, and it the became quite apparent that we blew a main tire. He was able to safely bring the aircraft to a stop on the runway, and when we examined the tire we discovered that we had run over quite a large nail. A man with the construction company drove over to us in his pickup, asked if we were okay, then drove us back to our hangar. That was my last flight as a student at Goodfellow AFB. It was late July, 1983. Ramp & runways at Goodfellow in 1985, after runways had been closed. was razed in the late 1980s to make way for a new Commissary & Base Exchange. 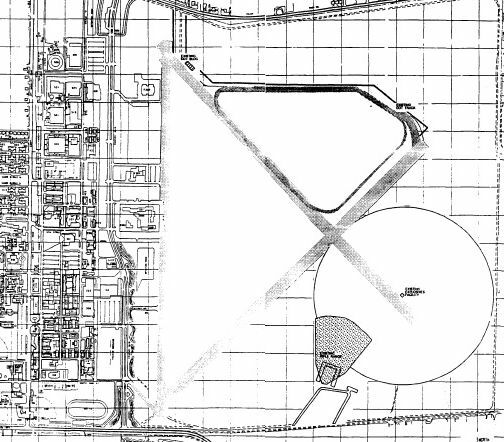 Goodfellow's airfield layout, from a 1989 Environmental Impact Report (courtesy of Rex Ricks). which landed in June 1990 to support the fire-protection training mission realigning from Chanute AFB. Two 1994 photos by Scott Murdock of 2 former hangars which remained standing at Goodfellow AFB. 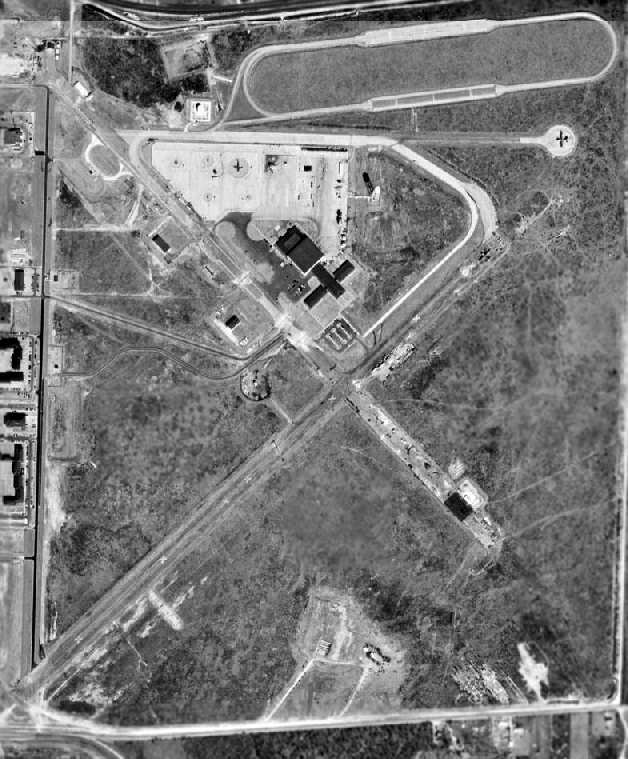 A 1996 USGS aerial view of Goodfellow AFB, after the field's closure. The airfield consists of three 5,300' runways, taxiways & a ramp. Note the 2 C-130s which remained on the field, at the northeast corner. although without any flight operations. A 11/8/03 photo by Brian Johnstone of a North American B-25J Mitchell mounted as a gate guard at Goodfellow. 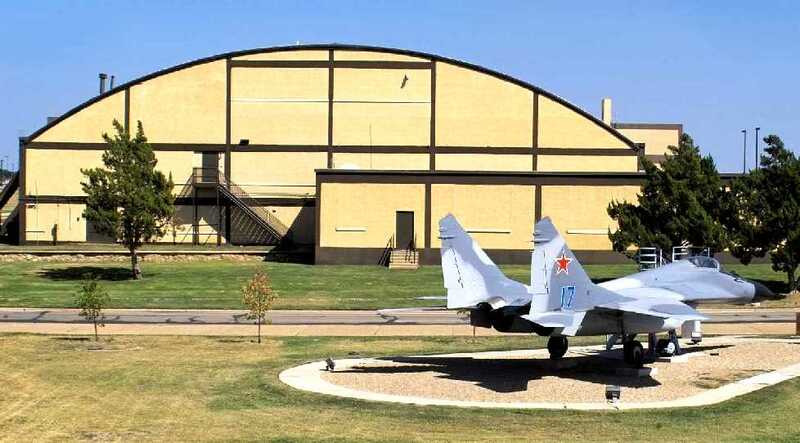 a 2005 photo of a once-feared Soviet Air Force MiG-29 Fulcrum A, on static display behind a Goodfellow AFB hangar. a C-130 Hercules, F-14 Tomcat, and CH-53 Sea Stallion (sans no tail & tail rotor). 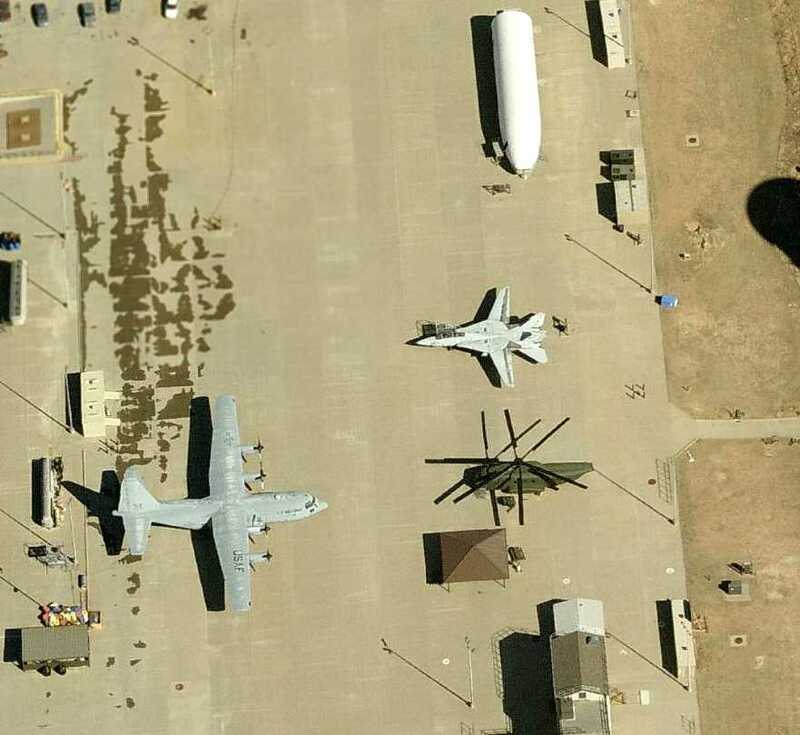 A circa 2007 aerial view looking west at a former Goodfellow hangar, a C-47 on static display, and what appears to be the base headquarters building. 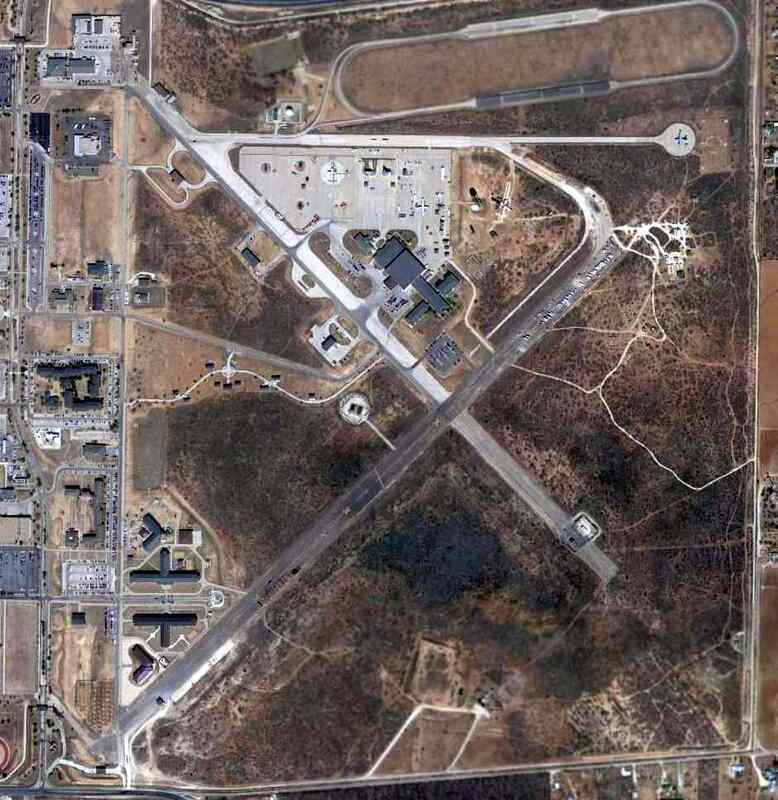 A 3/14/13 aerial photo of the extensive airfield facilities which remain at Goodfellow AFB. 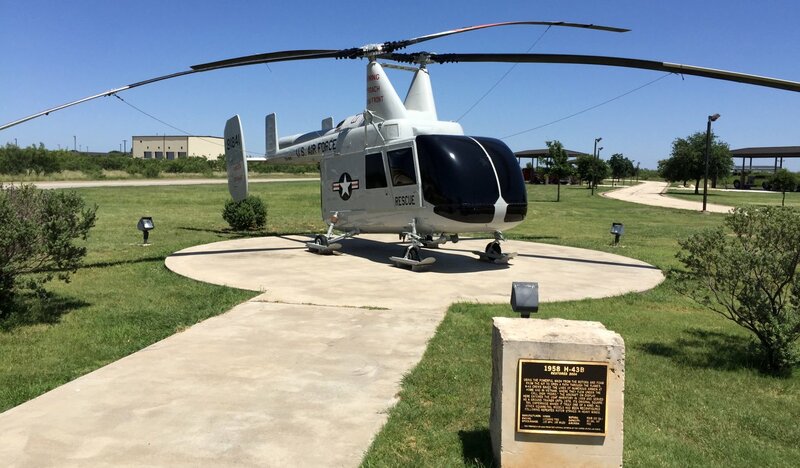 A 7/15/15 photo of a Kaman H-53 Huskie rescue helicopter on static display at Goodfellow AFB. Vancourt was simply labeled as "No 6" on the 1945 Austin Sectional Chart (courtesy of Chris Kennedy). as it was not yet depicted at all on the 1941 Austin Sectional Chart (according to Chris Kennedy). 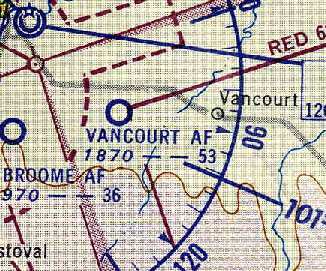 Vancourt Field was reportedly operational by 1943. 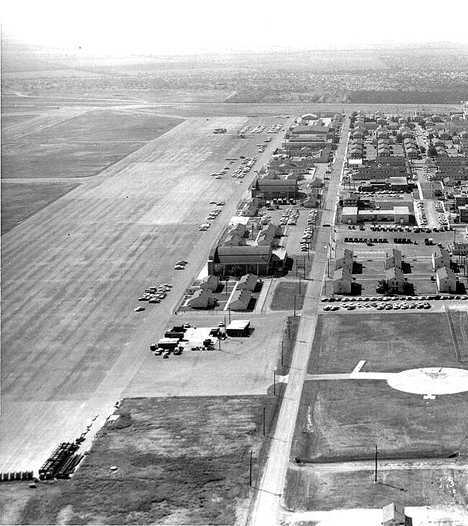 It was built as one of 7 satellite airfields which supported pilot training at Goodfellow Army Airfield. listed Goodfellow Auxiliary #6 but did not specify its runway configuration. Vancourt Field was declared surplus with the end of WW2 in 1945. Unlike many other WW2-era auxiliary military airfields, Vancourt was returned to active service in 1948.
as having a 5,300' unpaved runway. in contrast to earlier depictions of it having only unpaved runways. to support training of B-25 Mitchell bomber crews. Thus it became the only one of Goodfellow's satellite fields of which any trace still exists. 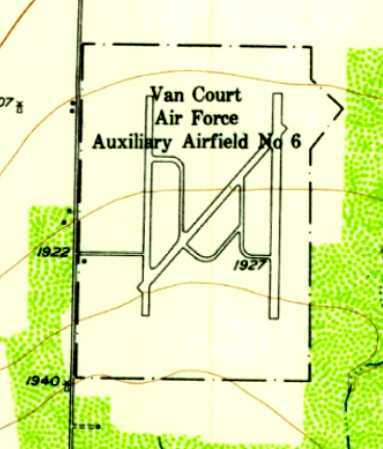 The 1957 USGS topo map depicted “Van Court Air Force Auxiliary Airfield #6” as having 3 paved runways & taxiways. until it was closed by the Air Force in 1961.
on the 1961 Edward's Plateau World Aeronautical Chart (according to Chris Kennedy). 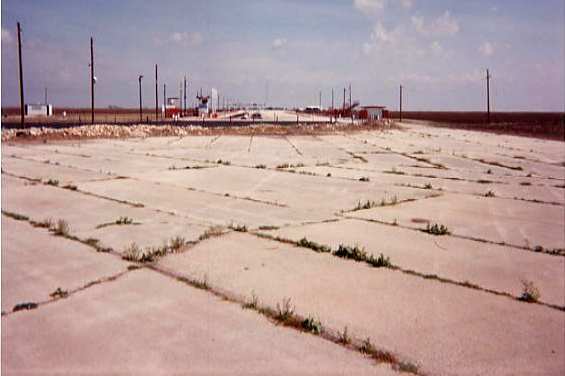 A 1994 photo by Scott Murdock of the former runway at Vancourt Aux AAF, with the section reused as a drag strip in the background. 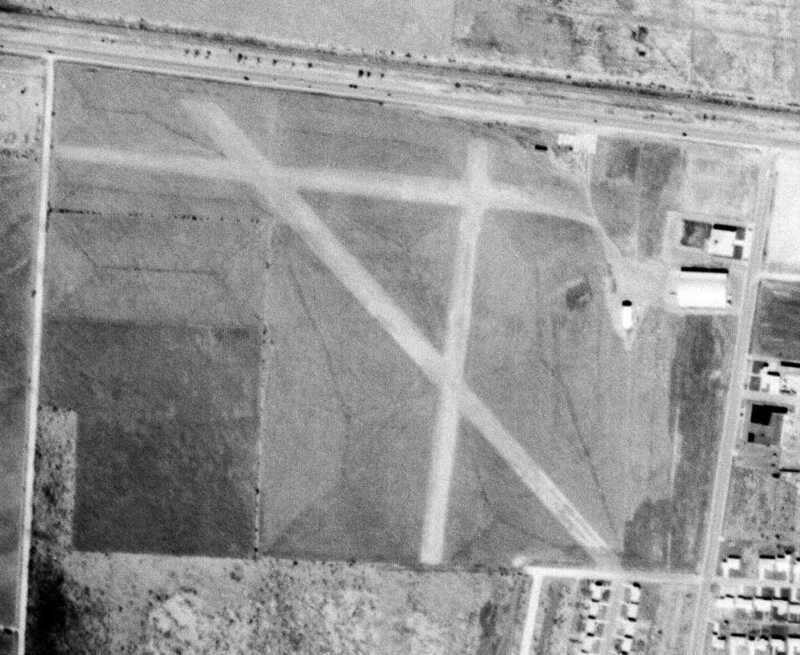 As seen in a 1996 USGS aerial view looking north, the Vancourt airfield consisted of 3 paved runways (each 5,000' long) & a number of taxiways. with the western N/S runway being used as a parking area, and the NE/SW runway serving as a drag strip. A 2015 aerial view looking north at the remains of the Vancourt airfield showed the runways to remain largely intact. A 1942 postcard of Vernon TX presumably depicted buildings of Victory Field (courtesy of Steve Cruse). Victory Field was not yet depicted on the September 1940 Dallas Sectional Chart. for the Army Air Forces during WW2 by Hunter Flying Service & Richey Flying Service. At its peak,Victory Field had 122 instructors, 175 aircraft, and 400 cadets for each class. 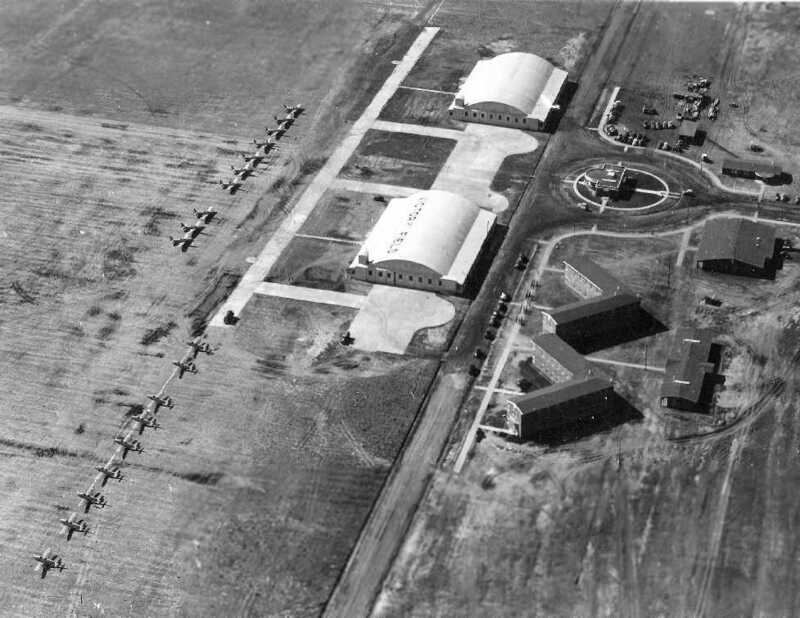 A WW2 -era aerial view looking southwest at Victory Field, showing 20 single-engine aircraft, along with 2 hangars & other buildings. Two undated WW2-era unit patches from Victory Field (courtesy of David Brooks). 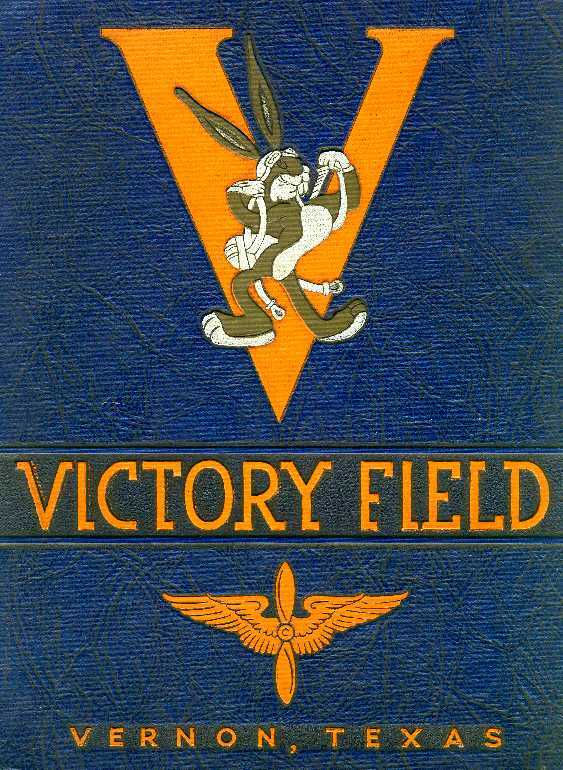 An undated WW2-era class book cover from Victory Field. Norman Delker was a flight instructor in the cadet training program from 1942-44. In his words, "It was a great group of men that did the instructing. Paul brown was the director of flying at the time. Dan Hunter was the owner of the operation. 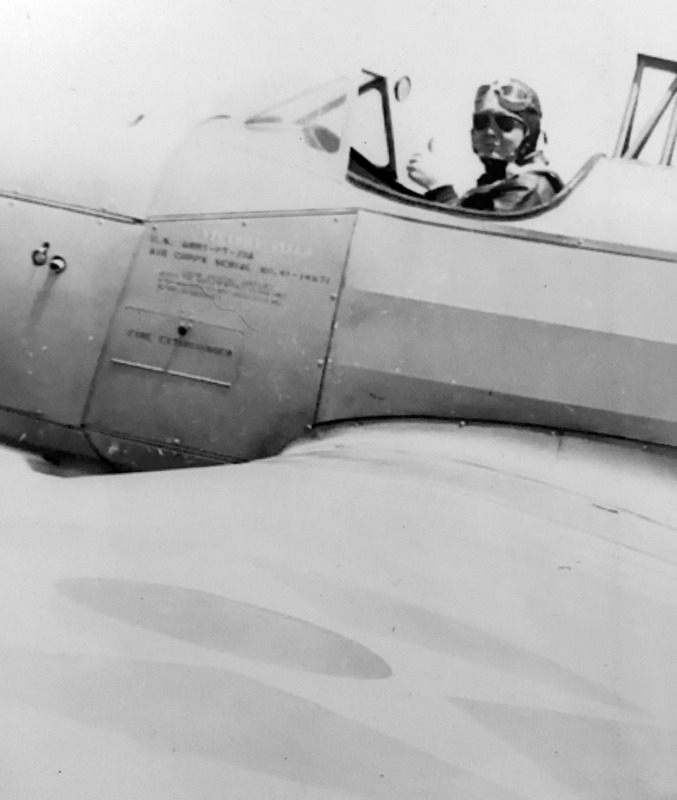 We had approximately 200 Fairchild PT-19s in which the cadets were given their first 65 hours in the air. After that they went on to BT-13s and then AT-6s when they got their wings upon graduation. A 1943 photo of Earl Parker giving the thumbs-up from his PT-19 at Victory Field (courtesy of his grandson, Matt Beckum). The earliest aeronautical chart depiction which has been located of Victory Field was on the February 1943 Dallas Sectional Chart. It depicted Victory as a civilian commercial/municipal airport. Victory Field was deactivated in 1944 because of the glut of AAF pilots. 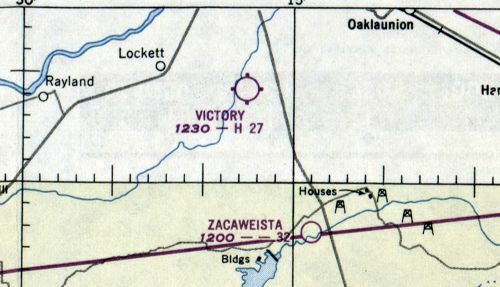 The September 1945 Dallas Sectional Chart depicted Victory as an auxiliary airfield. Victory Field was was depicted as a commercial airfield on the 1949 Oklahoma City Sectional Chart (according to Chris Kennedy). 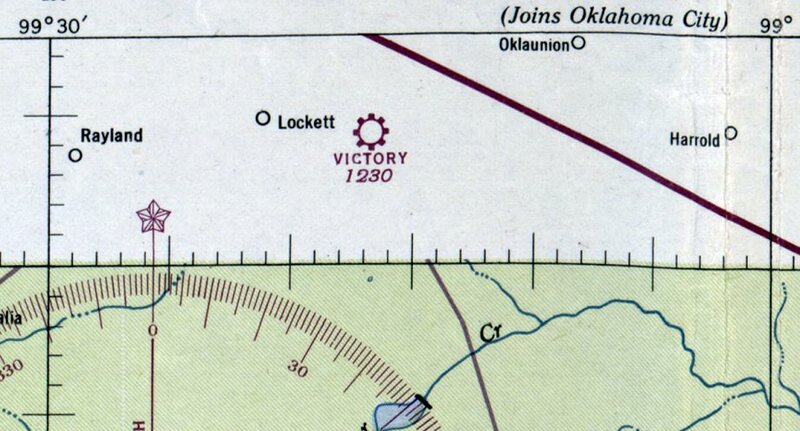 The last aeronautical chart depiction which has been located of Victory Field was on the February 1950 Dallas Sectional Chart. 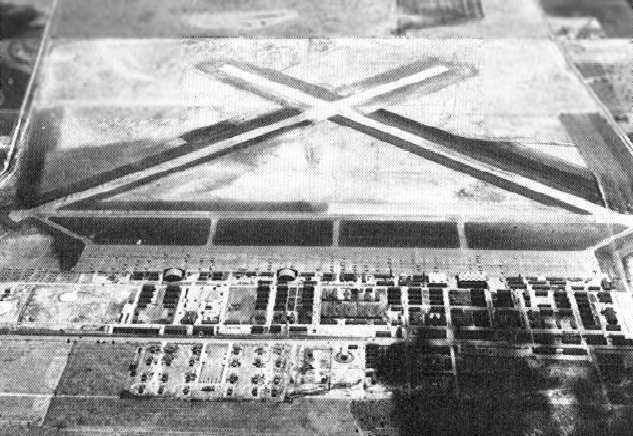 It depicted Victory as a civilian airport having a 2,700' paved runway. 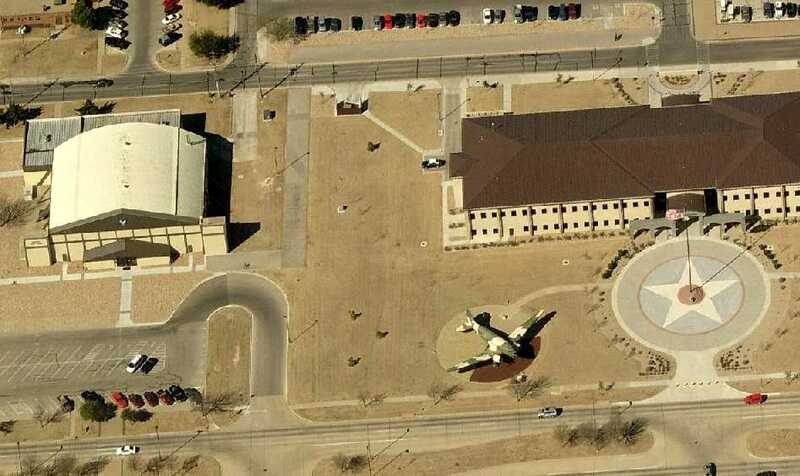 which established the Vernon Center as a unit of Wichita Falls State Hospital. Victory Field was no longer depicted at all (not even as an abandoned airfield) on the August 1952 Dallas Sectional Chart. 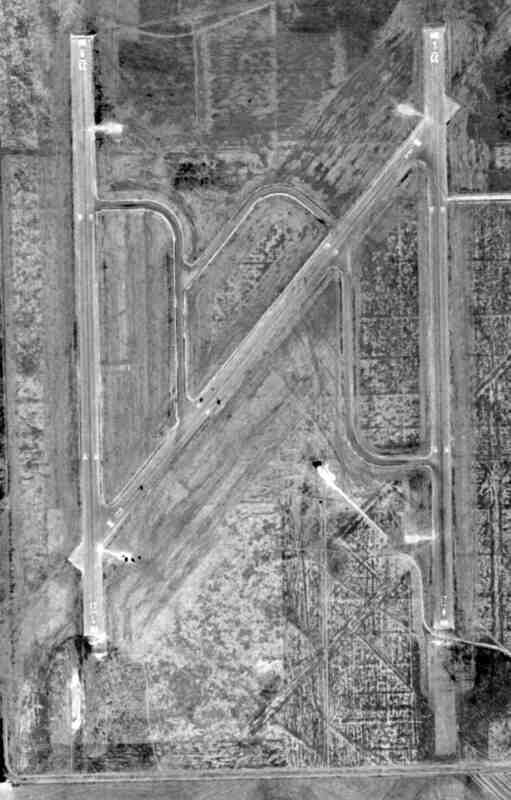 A 9/6/53 USGS aerial view showed Victory Field after the airfield had been closed but was still completely intact. 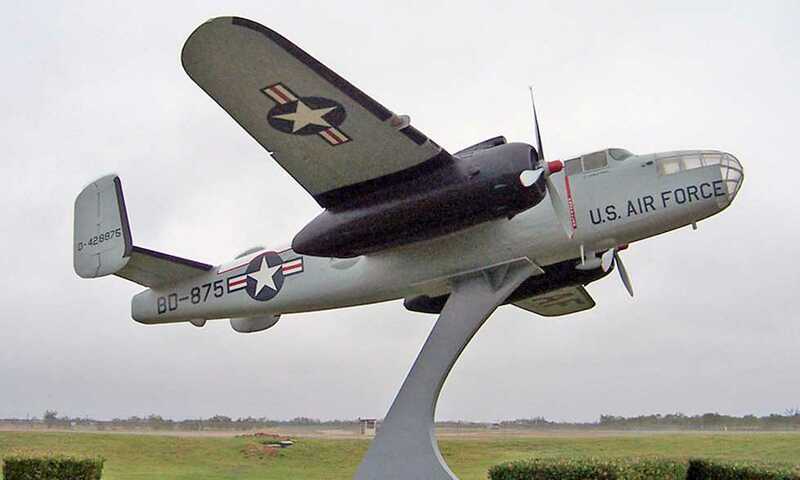 and is still in use at Wilbarger County Airport [in Vernon]. while my dad was usually out crop dusting in Stearmans." with the former Victory Field buildings labeled as Vernon State Hospital. Only 1 of the former hangars was still depicted. along with traces of the other 2 runways. The last of the 2 hangars had evidently been removed at some point between 1958-94. In 1995, the property became the Victory Field Correctional Academy, a military-style youth correctional facility. A 2001 photo by Scott Murdock of the entrance sign at the Victory Field Correctional Academy. A 2015 aerial view looking northeast at the site of Victory Field, showing the runway & ramp remains south of the prison buildings. A 10/26/18 aerial view by Matt Beckum from his USAF T-6 Texan 2 looking northwest at the site of Victory Field, where his grandfather, Earl Parker, served in 1943. The remains of the concrete northeast/southwest runway & the ramp are still visible, and several military buildings remain in use. 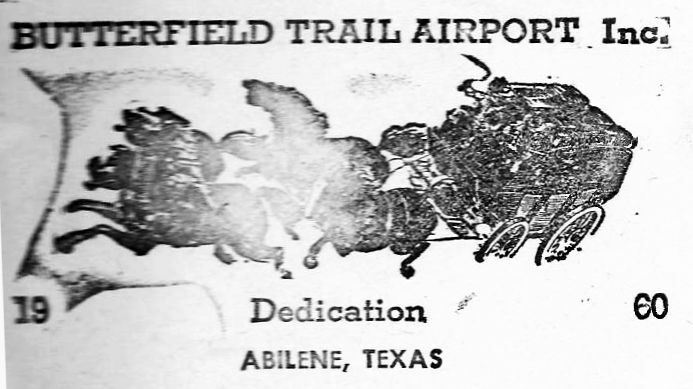 A 1960 postmark commemorating the dedication of Butterfield Trail Airport. 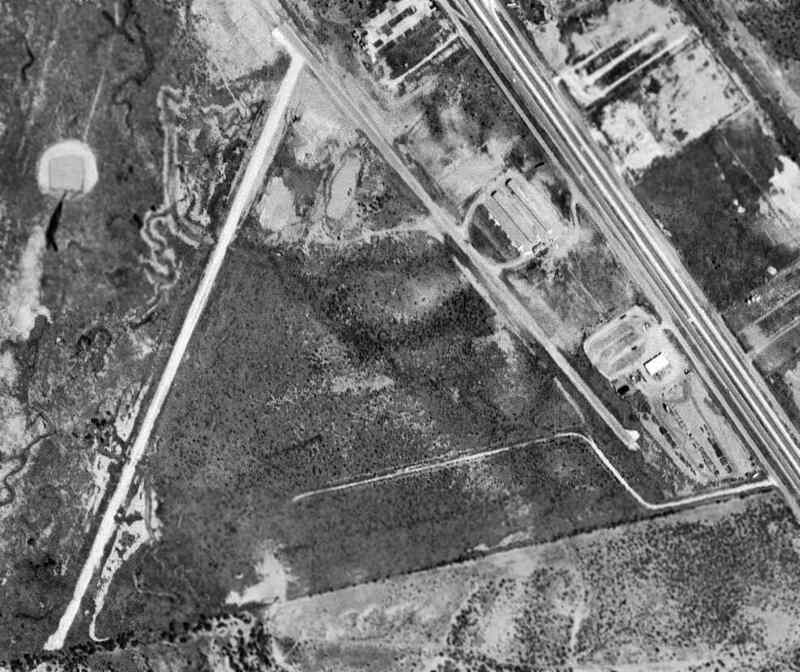 No airport was yet depicted at this location on a 11/11/54 USGS aerial photo. This general aviation airport was dedicated in 1960, according to a commemorative postmark. was on the March 1961 Austin Sectional Chart (courtesy of Chris Kennedy). 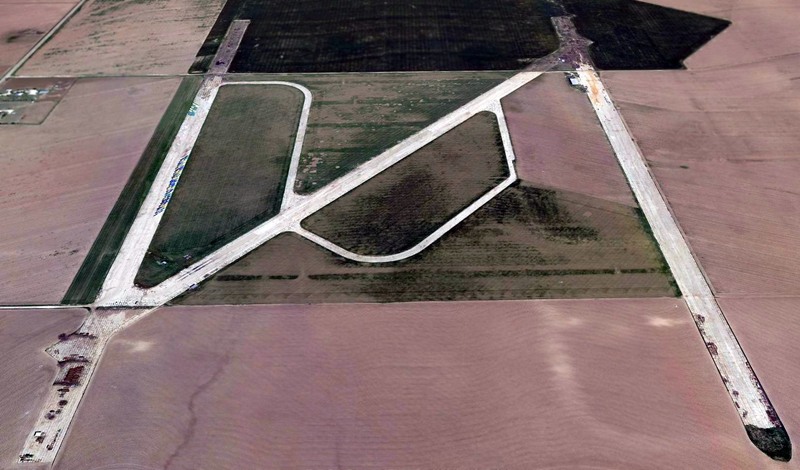 It depicted Butterfield Trail Airport as having a 3,100' unpaved runway. George Spurr recalled, “I have many fond memories of Butterfield Trail Airport. The airport, the people I met there, the airplanes we flew and hangared there - killing rattlesnakes - the list goes on. I made my solo flight there in 1962 & got my Private License later the same year in a Cessna 150 (N1152Y). I was in the Air Force then & Paul Volgamore was the Fixed Base Operator at the time & the ram-rod behind the Dyess AFB Aero Club. I worked there helping out, doing odd jobs & building flight time there from 1964-68 when I had some time off. The Butterfield Overland Stage company... That is where the airport got it name since the stage ran over that spot of ground on it's way to California. When I was at Butterfield you could still see the ruts made by the coaches traveling to & from back in their day. 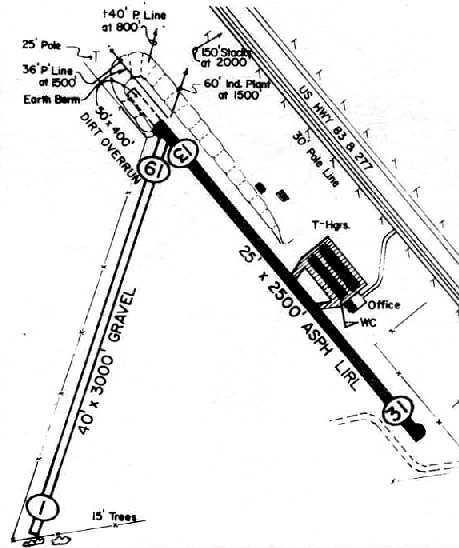 described Butterfield Trail Airport as having a 3,100' paved runway. It listed the operator as Air Service Inc., and listed the manager as Paul Volgamore. 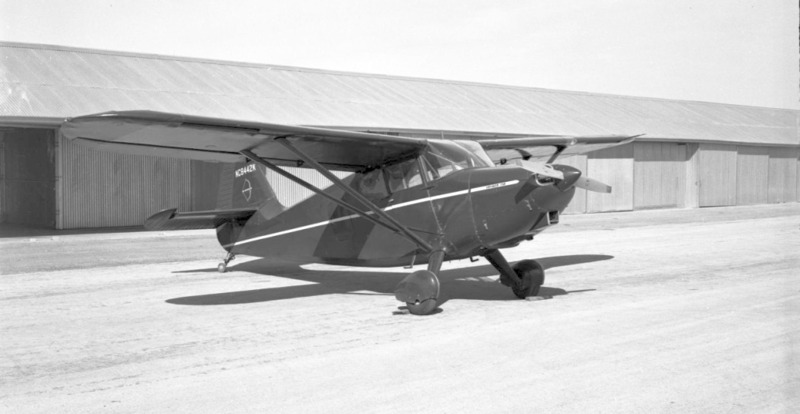 A 1966 photo by George Spurr of the Cessna 162 in which he flew his first solo at Butterfield Trail Airport. A circa 1966-73 photo by George Spurr at Butterfield Trail Airport of “a customer at the fuel pump - a frequent visitor, and a one-off I think called the Clark Dollar. 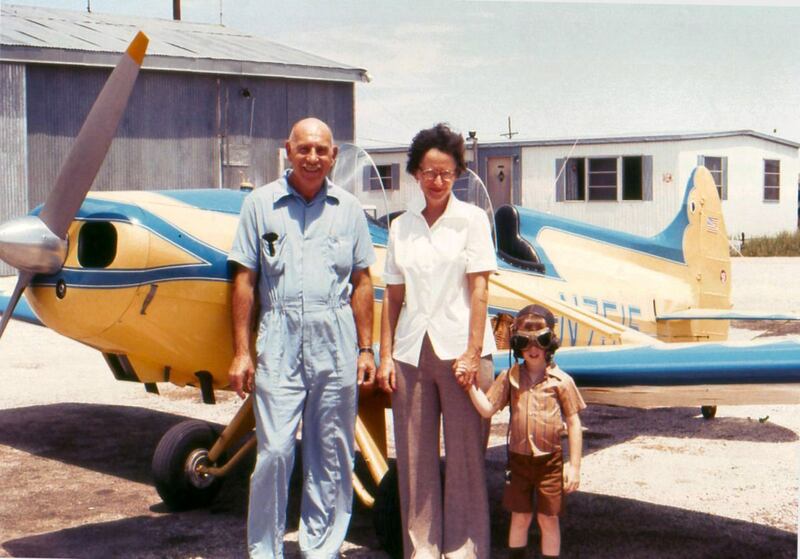 A circa 1966-73 photo by George Spurr at Butterfield Trail Airport of “my frequent customers with my little son. Taken at the South end of the hangars looking South East. The large double-wide mobile home was used as an office, pilot lounge, and training room. The corner of the hangar behind them has a small office / line shack in the corner & contains the only paved hangar(s) on-site. It was a double hangar big enough for at least 2 airplanes. 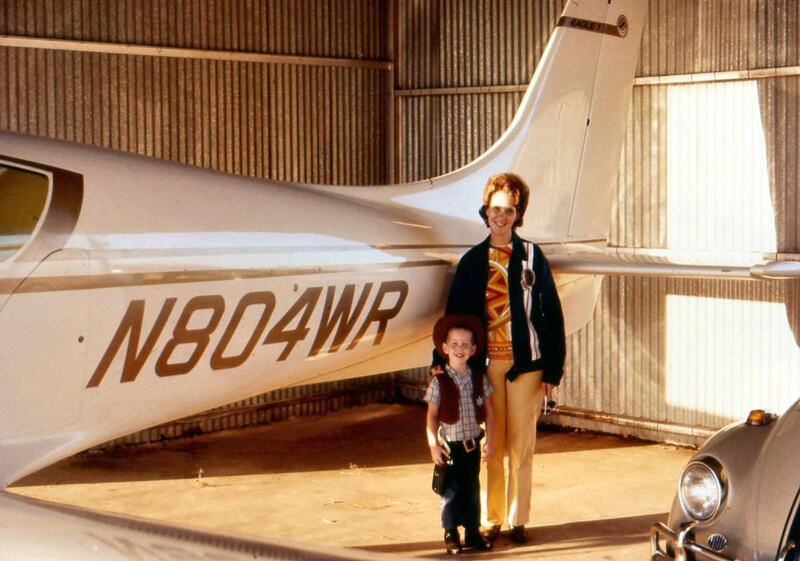 A circa 1966-73 photo by George Spurr at Butterfield Trail Airport, “Inside the 'big' hangar with the Windecker Eagle prototype (my wife & son). A circa 1966-73 photo by George Spurr at Butterfield Trail Airport, “Looking northeast: One of my rental 172's taking off from the asphalt runway for a local pleasure flight. and way in the background right at the end of the hangars you can see the stacks of the Pride Refinery across the highway from Butterfield. George Spurr recalled, “I came back to Butterfield as the 'live-in' manager under Abilene Aero in 1970 (til about 1973). I bought a mobile home for my family & we lived on-site. Linda Medellin reported that “Paul Volgamore often spoke fondly of operating the airport. 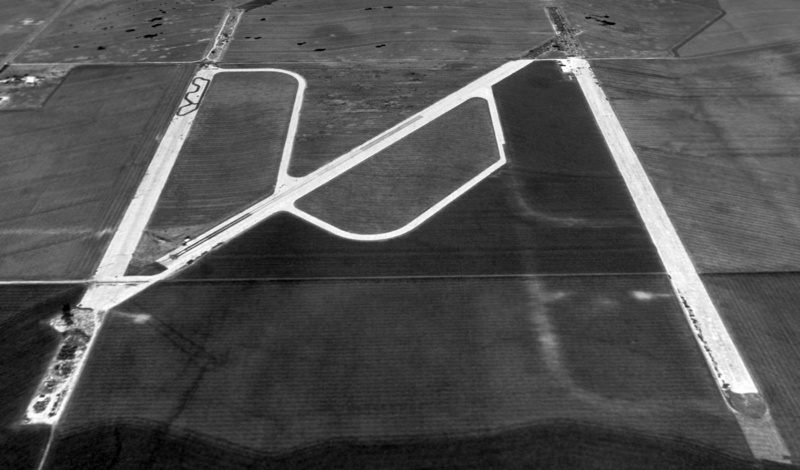 A 9/29/67 USGS aerial photo depicted Butterfield Trail Airport as having a one paved runway & one unpaved runway. Three single-engine planes were visible around 2 hangars on the northeast side. as having 2 runways & several buildings on the east side. as having a 2,500' asphalt Runway 13/31 & a 3,000' gravel Runway 1/19. Two hangars were depicted on the northeast side of Runway 13/31. traces it's roots back to Butterfield Trail Airport. The business began in 1968 as a partnership with 4 employees. 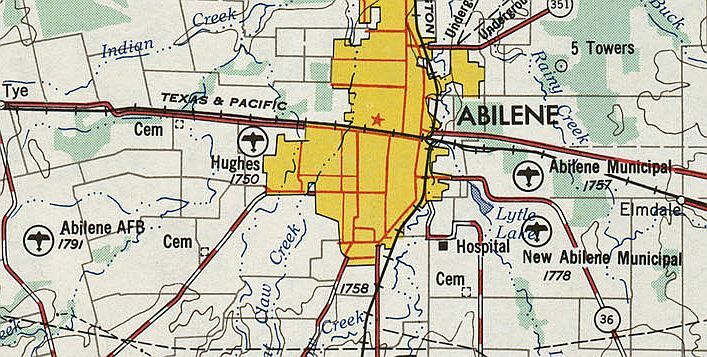 They moved to Abilene Municipal in 1971. Two rows of T-hangars & an office were located along the east side of Runway 13/31. The managers were listed as O. Higgins & K. Waddell. 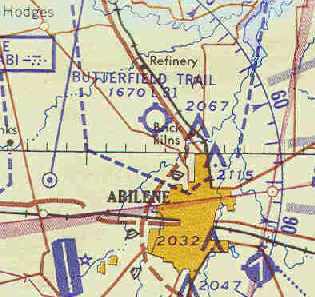 The last aeronautical chart depiction which has been located of Butterfield Trail Airport was on the 1978 Dallas Sectional Chart. 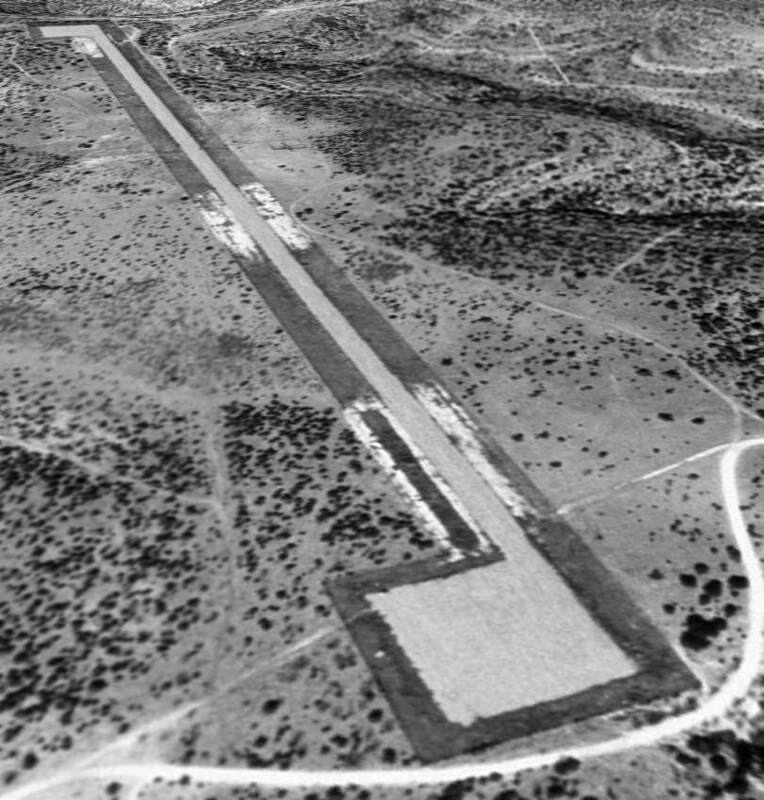 It depicted Butterfield Trailer as having a 2,500' paved runway. and eventually used for storage of oilfield equipment. 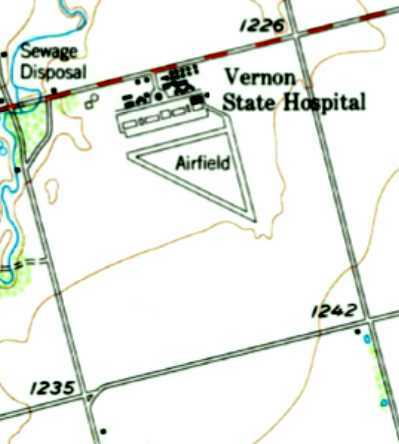 as it was no longer listed among active airfields in the 1982 AOPA Airport Directory. 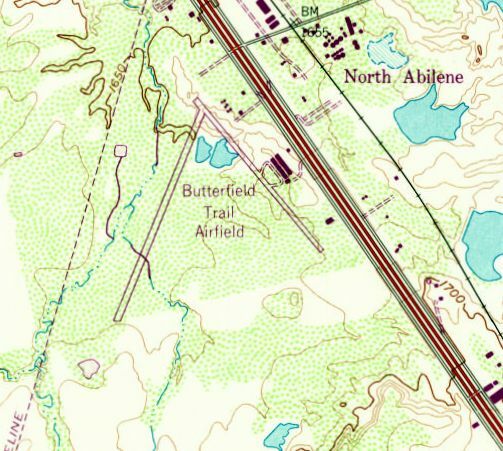 Butterfield Trail Airport was still depicted on the 1987 USGS topo map, even though it was apparently closed by that point. 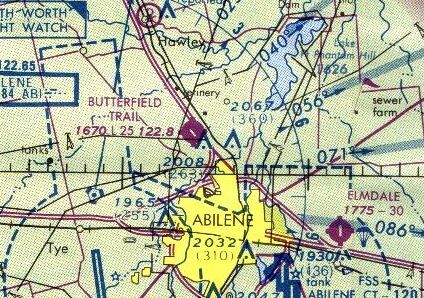 The January 1987 Dallas Sectional Chart (courtesy of Stu Sibitzky) depicted Butterfield Trail Airport as an abandoned airfield. A 1995 USGS aerial view looking north showed the 2 runways of the former Butterfield Trail Airport were still quite discernible, although somewhat deteriorated. Several of the former hangars appeared to still be standing. 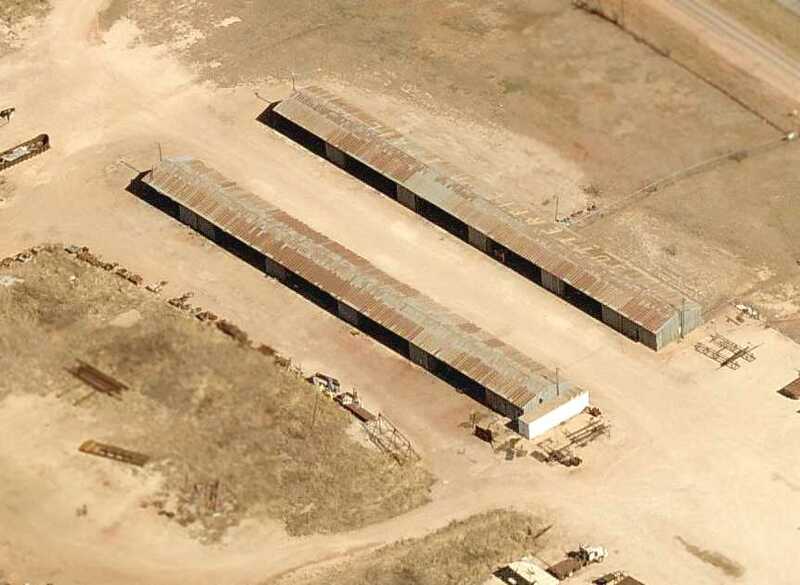 A circa 2006 aerial photo looking north at the 2 former hangars which remain standing at the site of Butterfield Trail Airport. A 2014 aerial view looking north showed the site of Butterfield Trail Airport remained recognizable as a former airfield. The site of Butterfield Trail Airport is located west of the intersection of Route 83 & Market Road. 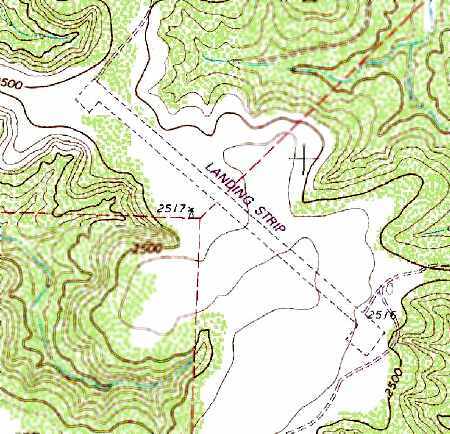 D-Bar Ranch Airfield was depicted simply as “Landing Strip” on the 1987 USGS topo map. George Horn recalled, “I personally supervised the construction of the airfield. I personally designed & directed it's construction for the owner, circa 1983-86.
owned at the time by S. E. 'Skinny' Adams & his wife Elsie & their trust. Skinny was also the owner of Adams Abstract Company in Robt Lee TX. and I worked for the family as their chief pilot (under another business they owned, Lamar Savings, of Austin). Elsie was a retired schoolteacher. Two truly adorable people. and I designed & supervised its construction. It consisted of a caliche underlayment & covered with a 2-course oil-penetration mix asphaltic topcoat. (you can still see that area as the lighter-colored area alongside the middle portion of the runway). for 12' long creosoted poles for fence posts. George continued, “It has 300' x 300' turnarounds/parking at each end, and was never lighted. It was painted with reflective center stripes in 1986.
used it only a few times, and then it was relegated to an unused status (remember the S&L failures of 1986?). It was depicted as "Landing Strip" on the 1987 USGS topo map. as it has small trees & brush which has grown up penetrating the runway. 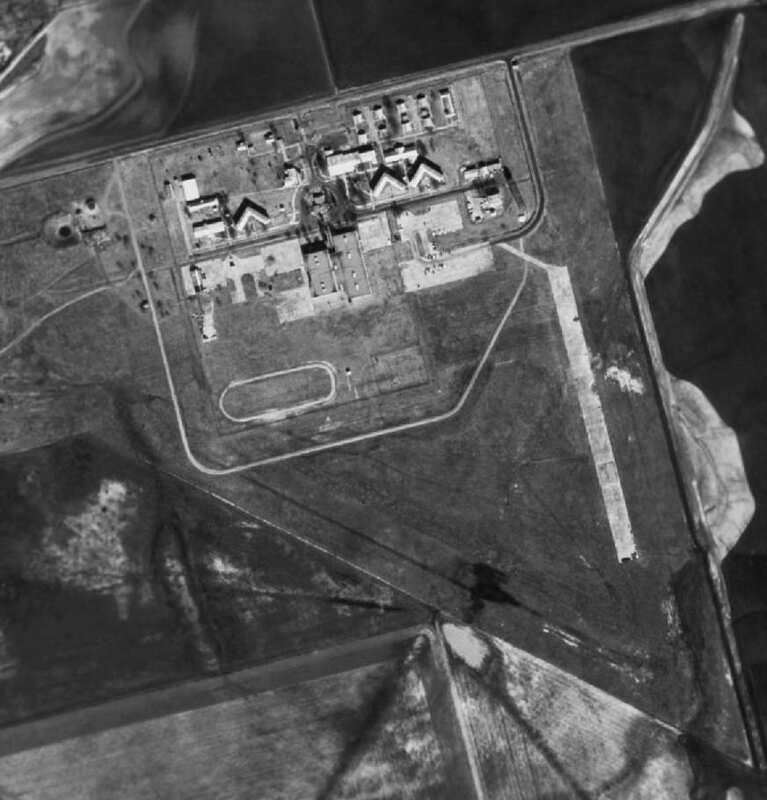 The earliest photo which has been located of the D-Bar Ranch Airfield was a 1/28/96 USGS aerial view looking northwest. It depicted the airfield as consisting of a single paved 5,280' runway, with a paved ramp area at each end of the runway. 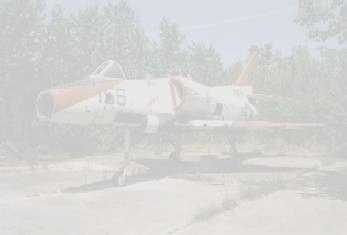 There did not appear to be any signs of any buildings, or any indication that the field had been used recently. This field was no longer depicted at all (even as an abandoned airfield) on 2002 aeronautical charts. 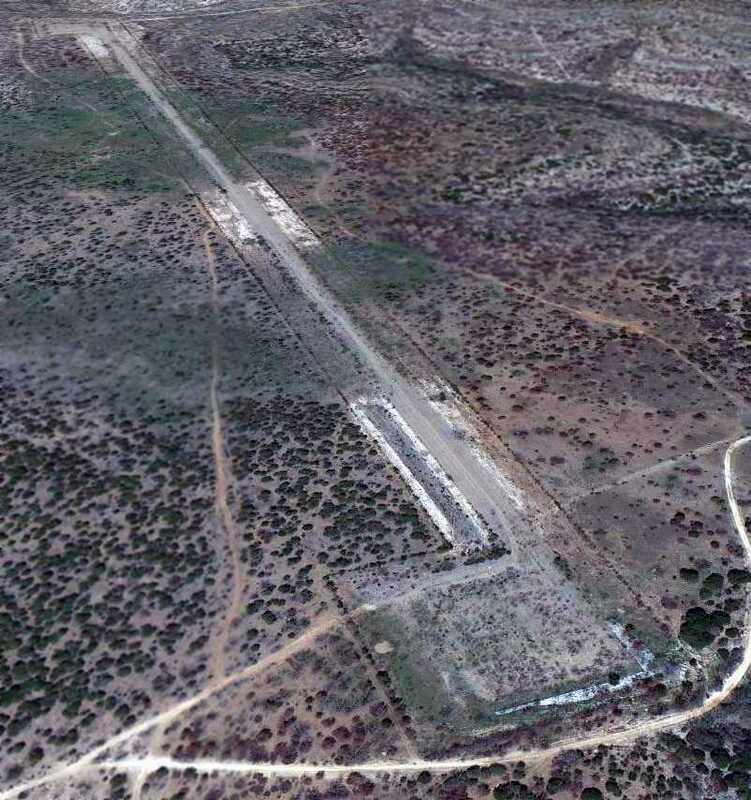 A 1/21/12 aerial view looking northwest at the remains of the D-Bar Ranch runway.